This year’s Wordstock was a mere shadow of years past. Perhaps the shows failing was the result of the tough economic times, or the shift in the board of Wordstock. Whatever the cause this year’s popular book festival was anything but festive. There are a lot of places you can place blame for the failing of Wordstock: Widen & Kennedy’s horrid website made it almost impossible to figure out what was going on when (a prime example of form over function) it was nearly impossible to discern exactly how to connect with authors. 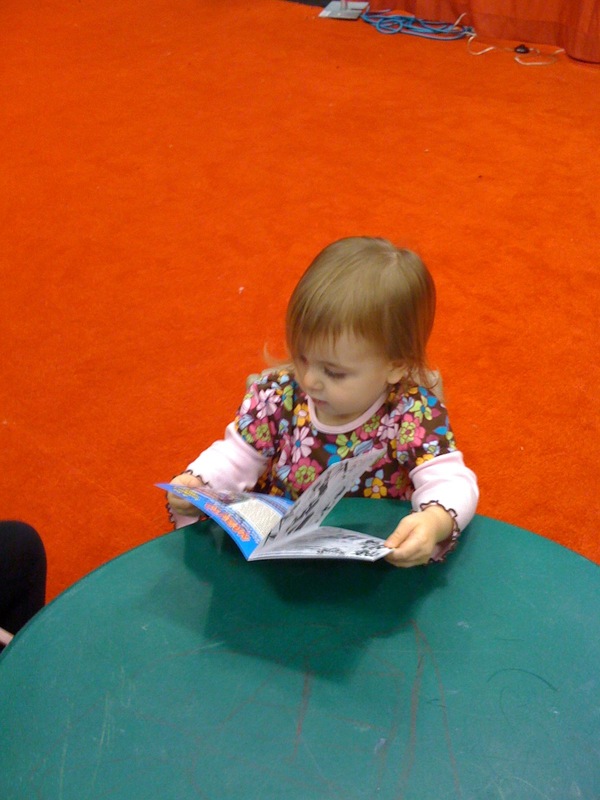 Instead of being a useful guide to Wordstock the site was merely a Wordstock brand experience. Blame could also be solidly put on the shoulders of everyone involved with the show’s logistics. Author signing tables were shoved in the far end of the convention center, behind a cage of ropes which left authors looking like bored lions on display at the zoo. With no real signage there was no way to see who exactly would be signing when. Authors were given tiny paper place cards to identify them in their misery. Beyond the lonely authors just waiting for someone, anyone to ask them to sign their books, were the painfully depressed book sellers. As I strolled the show floor I heard several of the publishers remark that they hadn’t sold a single book the entire day. Many wore long faces and a few had simply given up and were abandoning their booths to commiserate with fellow publishers. A former centerpiece of the show, the Target kids area was also depressing. As we made our way over there just before 4pm they were already tearing it down and packing it away. Even the Target mascott dog looked bored. My daughter asked if she could color and they told her no. Nice. With the poor floor design it was almost impossible to see and hear the main authors. 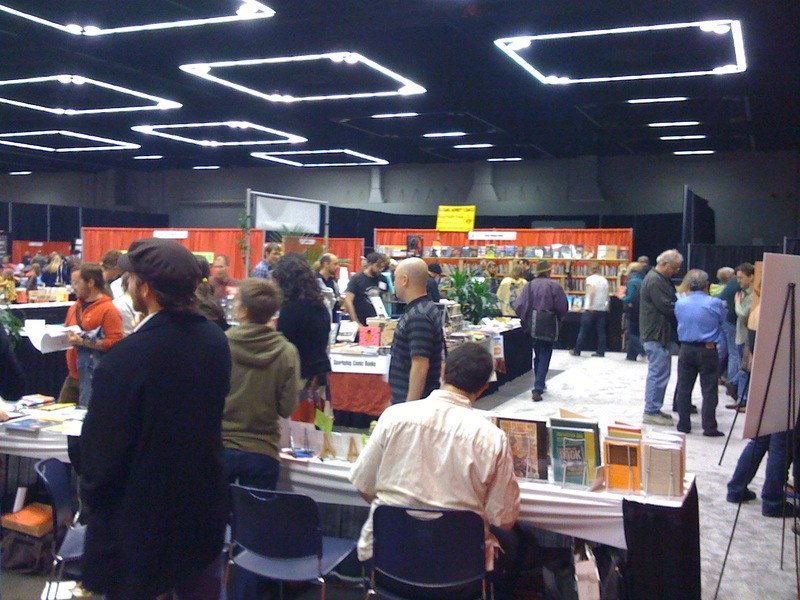 When John Hodgman got up to speak the area was so confined I ended up standing in the Powell’s booth that blocked the way between the show floor and the main stage. I finally gave up trying to listen to Hodgeman and left (I simply could not see or hear). Another failing of Wordstock this year was their inability to pull in the same level of word class authors as they have in years past. Consider in years past Wordstock hosted luminaries as Gore Vidal, Ursula Le Guin, Sarah Vowell and Ira Glass. Between Powell’s special author events and Portland Arts and Lectures, Wordstock seems to be left pulling from second tier authors – this year’s highpoint was ‘That guy from the mac commercial”. The one bright spot of the show was the alcove of comic book companies under the banner of “Stumptown Comics”. I met up with Jamie S. Rich and Joelle Jones who were there signing their respective books, but despite the fact that their area actually had people mulling around they informed me that nobody was really buying anything. After departing from the completely depressing festival I decided to try to make the evening event “The Text Ball”. Unfortunately the logistical failings of Wordstock extended to this event as well. Who in their infinate wisdom schedules an event across from the Rose Garden on the same night as a major sold out Basketball game? How about the same night as BOTH a major sell out Basketball game AND a Winterhawk hockey game in the Memorial Colosseum! I literally drove around and around for a half hour, driving as far out as the lloyd center and was unable to find a single parking spot (paid or otherwise) so I had to skip it all togehter. It’s a shame that Wordstock is in the state it is in. Portland deserves better. While you can excuse some of the shows failing on the bad economy the real issues obviously run deeper. I was at the main branch of the Multnomah County Library yesterday. There was a very large number of people there checking out some kind of "Keep Portland Weird" summit. Maybe a lot of those people blew off Wordstock. I've been to the Convention Center a few times and I always find the space to be sucky. But I guess Wordstock is more than the book fair. There are a lot of things going on out in the community. Perhaps people are showing up for those. Portland is a small town. As an author involved in this year's Wordstock, the problems were far deeper than the ones you correctly identified on the floor. At the last minute, authors were flaking out and the organizers were so overwhelmed that production responsibilities were shoved off on moderators of panels without their permission or knowledge. I moderated a panel and was asked to contact my authors to determine if they needed AV equipment, but the organizers were thoughtful enough to ask the panel members to come up with a list of questions for me to ask. Perhaps because I wasn't moderator enough to come up with a few on my own? They also missed inviting several top name authors simply because the organizers, it was my impression, didn't even know what top authors were near and available. The introductions were written by the Wordstock staff and those who introduced authors had no knowledge when they agreed that this would be the case. A few days before the event, those introducing were basically told they were simply a warm body who would read something about COWs and Wordstock's stilted, pre-crafted introduction. And when people introducing began to flake — what writer wants to read that schlock?– they frantic organizers sent emails saying that very thing — people are flaking!!! Will you introduce someone??? The production was poor and the organizers were overwhelmed. Combine that with the fact that book industry trade shows like BEA are so far superior to these little city festivals and those in the industry are left wondering, why bother? I know that as a professional author and publishing-industry reporter, I'd far rather spend my time and energy at BEA than I would at these silly festivals. Thanks for your behind the scenes insights. 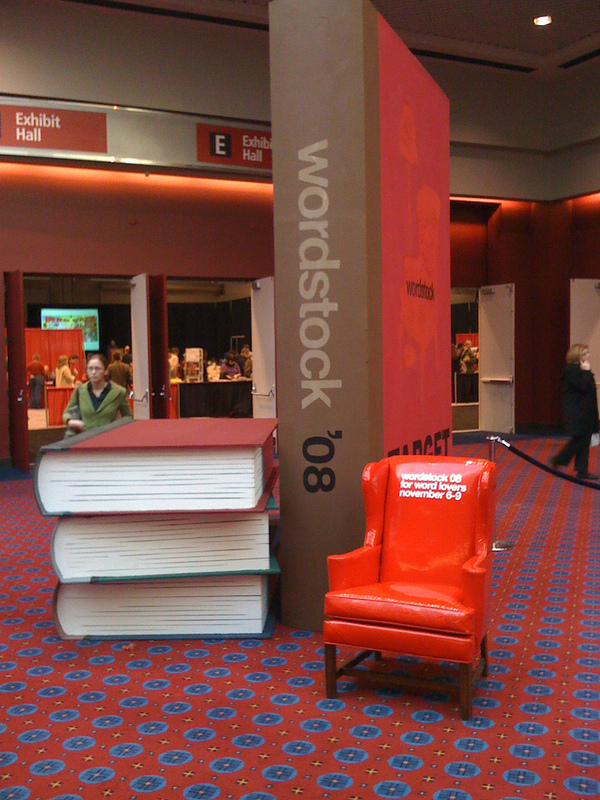 The ultimately frustrating thing is that a large scale book festival could be a real hit in Portland, but I don't think the way that Wordstock is going that it will fulfill that promise. The current show seems to have too many 800lb gorillas with Widen + Kennedy, Powell's and Target all seeming to hold a different piece of the reigns of the show. I also get the impression that Powell's isn't necessarily interested in seeing Wordstock take off, as in some way it competes with their own efforts which they do year round. The trend with Powells has been towards big author events where you have to buy a full price hard cover book to be able to hear an author read. I've never paid to hear an author read and never plan to. Author readings are marketing for that author and their works and there have been MANY readings where I've picked up several books by an author. These events seem to be great money makers and are often sold out, so I'm thinking that they'd rather have the Sara Vowell's of the world come under their wing and not Wordstock. Well, I think Powell's ought to charge to see authors read. Just like you pay to see a band, or a movie. Too often people attend reading and never buy the book, or they go buy it on Amazon due to the deep discount. No skin of the author's nose…until indie bookstores start dropping like flies and then suddenly (like in Southern California) there are few indie bookstores at which authors can read. The problem with the chain bookstores is that they buy for all of their stores, so if the main buyer doesn't like your book, then your book won't be at the BN or Borders near your house or where your book was set, as was the case with one of my hardcovers. As for Powell's the problems with that store run very deep. The don't pay their employees anything near a living wage, the stores themselves are dirty and disorganized. The staff reflects these qualities and their ridiculous pay doesn't engender them to do much more than surf the internet all day long. Add to that the fact that Powell's has the same effect on indie bookstores in Portland as chains do elsewhere. All that being said, authors should charge to give a reading. I don't understand why books, authors, indie bookstores are perceived as something that should be cheap or free. It's remarkable to me that in Portland, writers are charity cases. They see themselves as worth not much more than the $50 or so they get paid to write for the local presses or lit mags. I get paid $1 per word and when I've told PDX writers that, I've had reactions like "How could you ask someone to pay you that?" Excuse me? Words are a commodity, just like a logo design or a cup of coffee. It's about time we start treating them as such. All of us, readers and writers alike. I can't recall where I read it, but there was a commentary about the book industry and how rampant discounting has created an environment where the consumer's expectations are that you simply don't pay the cover price of a book. This of course leads to a whole host of issues (including publishers inflating book prices to adjust for discounting) and as you mentioned the total discounting of the value of writers and the words they write. I wanted to say too (can't exactly say this stuff on my own blog) that if writers are going to charge, then they ought to at least be somewhat entertaining. I wouldn't pay to see 99% of the authors I've seen read. Discounting books is a tragedy in our culture. In some countries in Europe, it's actually illegal. I have no idea why we all must get every single thing as cheaply as possible. When you think about movies they're two hours and cost $9 in many places. So that's $4.50 an hour (about). A trade paperback will run you $13. How many hours do you spend with that? It's total lunacy. I agree with you about the authors this year being "second-tier", but I was pleased to see Aimee Bender, Willy Vlautin, Charles Cross, and Lynda Barry on the list. And the John Hodgeman performance was impossible to watch because of the crowd. I was standing at the back of the rows of chairs and every time I slightly inched backward, I had someone from Workstock telling me not to block the aisle. That's not to say I had a horrible time—I was able to talk to some cool local writers and artists (Shannon Wheeler and Megan Clark) as well as pick up information from Indigo Press and the Independent Publishing Resource Center. There's definitely a way to balance "A-List" authors and lesser known but buzzworthy writers. It was just clear this year that the festival lost track of that balance. Shannon was in the Stumptown Comic area which I think was one of the more successful areas of the show. I really liked his drinking fish shirt (almost picked it up myself). I missed seeing Monica Drake, which I think is wildly talented because there was no clear schedule posted about who would be where, when. I mean how hard is it to put the appearance information on the author's individual pages? But thanks for your comments. It's a shame it wasn't easier to see Hodgeman!